LOCATION.--Lat 42°06'52", long 74°21'51" referenced to North American Datum of 1927, Ulster County, NY, Hydrologic Unit 02020006, on left bank at outlet of Shandaken tunnel on Esopus Creek, 70 ft upstream from State Highway 28 bridge, and 3.3 mi northwest of Phoenicia. PERIOD OF RECORD.--February 1924 to September 1950 and October 1960 to September 1996 (monthly and yearly discharge only), December 1996 to current year. (Prior to October 1950, published in WSP 1302, October 1960 to September 1970, in WSP 2102). Records for October 1950 to September 1960 are unpublished and available in files of the Geological Survey. REVISIONS HISTORY.--WDR NY-04-1: 1998-99, 2001, 2003. GAGE.--Water-stage recorder. Concrete control since May 8, 1998. Datum of gage is 965.7 ft above NGVD of 1929 (from levels by New York State Department of Transportation) and 964.39 ft above NAVD of 1988. 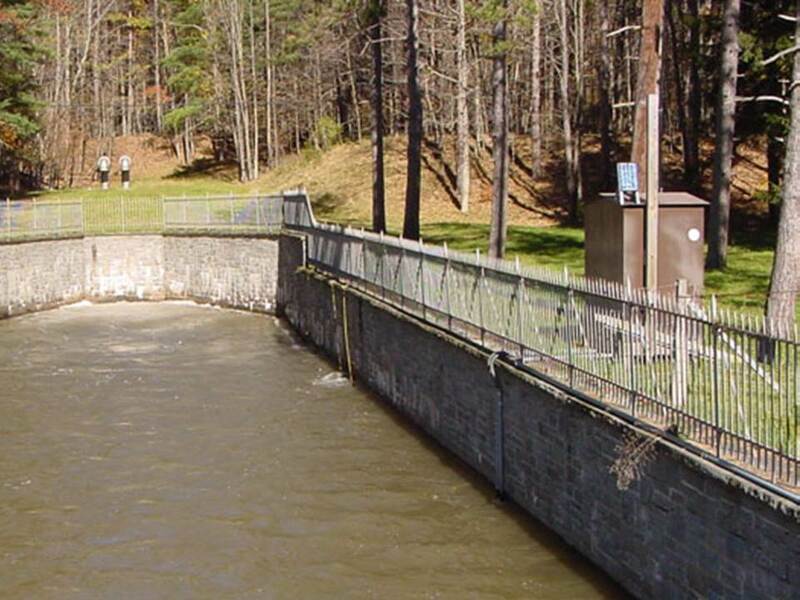 REMARKS.--Flow completely regulated by Schoharie Reservoir (station 01350100). Stage-discharge relation affected by backwater during high flows along Esopus Creek. Records prior to October 1996 provided by Department of Environmental Protection, City of New York. Water Years 2014-18: Records good except those for estimated daily discharges and those below 5 ft³/s, which are poor. EXTREMES FOR PERIOD OF RECORD.--Maximum discharge, 947 ft³/s, Sept. 1, 2018, gage height, 5.53 ft; maximum gage height, 10.85 ft, Aug. 28, 2011, affected by backwater; minimum discharge, 0.04 ft³/s, Sept. 24, 2012; minimum gage height since concrete control, 1.71 ft, Sept. 24, 2012. PERIOD OF DAILY RECORD1.--WATER TEMPERATURE: July 1997 to current year. EXTREMES FOR PERIOD OF DAILY RECORD1.--WATER TEMPERATURE: Prior to Oct. 1, 2007--Maximum, 25.5 °C, Aug. 4, 5, 2006; minimum (water years 1998-99, 2002-07), 0.0 °C, Jan. 19, 1999, and may have also occurred during period of missing record January 1999. WATER TEMPERATURE: After Oct. 1, 2007--Maximum recorded, 24.9 °C, Aug. 18, 2016, but may have been higher during period of instrument malfunction in Aug. 2010; minimum, 0.3 °C, Mar. 5, 6, 12, 13, 27, 2015.